Welcome to the Holiday Inn Silom Bangkok, and experience our superb service. Conveniently located on Silom Road, within walking distance of the river and the business and the entertainment district. A total of 700 fully furnished guest rooms are allocated in the two towers - Plaza Tower and Crown Tower. All rooms are equipped with minibar, cable TV with movie-on-demand, dataport, in-room safe, bathtub, in-room tea/coffee making facility, voicemail, specially designed sleep enhancing bed, large working table, teledyne massage shower, hair dryer and IDD telephone. Consisting 16 floors of 372 newly refurbished guest rooms including twin / king superior rooms and seven Plaza Suites. All rooms in Plaza Tower are equipped with minibar, cable TV with movie-on-demand, dataport, in-room safe, bathtub, in-room tea / coffee making facility, voicemail, specially designed sleep enhancing bed, large working table, teledyne massage shower, remote controlled lighting & air-conditioning, hair dryer and IDD telephone. Interconnecting rooms available on request. Consisting 27 floors, including three Executive Club Floors and a Priority Club Floor, with a total of 328 guest rooms including twin / king superior rooms, 21 Crown Suites and a Presidential Suite. All rooms in Crown Tower are equipped with minibar, cable TV with movie-on-demand, dataport, in-room safe, bathtub, separate shower cubicle, in-room tea/coffee making facility, voicemail, specially designed sleep enhancing bed, large working table, teledyne massage shower, hair dryer and IDD telephone. Interconnecting rooms available on request. 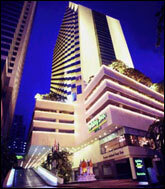 Holiday Inn Silom Bangkok offers a number of dining options. Window on Silom presents a wide variety of international and Asian favourites. Tandoor features northern Indian delicacies and Thai Pavilion showcases the best of Thai cuisine. Orchid Lounge serves light meals, snacks and high tea. Cheers Pub provides a friendly pub atmosphere. 24-hour Room Service Dining complements the varied outlets. Children will enjoy the kids' menu. Holiday Inn Silom Bangkok houses three main function rooms that can be broken down into soundproofed 11 function rooms of varying sizes and capacities, catering up to 850 people, arranged by a team of trained professionals. The Crystal Ballroom has a total area of 916 square metres, with a capacity for hosting up to 550 people for a sit-down dinner, while the Emerald and Topaz Rooms are available for events of a smaller scale. State-of-the-art audio-visual equipment, together with a fully equipped Business Centre, will accommodate all meeting needs. Recreation and relaxation are high on the priorities at Holiday Inn Silom Bangkok. The Health Club features a well-equipped gym, tennis facilities, jacuzzi, sauna, steam bath and massage services, and there is an outdoor swimming pool with children's pool and sun deck. The hotel's limousine service is available for airport transfers, car and driver rental, single trips and even guided tours. The swimming pool, located on the 6th floor of the Crown Tower, is surrounded by a landscaped sun deck. The fully equipped Health Club features a sauna, steam room, jacuzzi, massage service, gym and a tennis court. The Business Centre is fully equipped to provide all business needs. Services include stenography, telex, facsimile, cables, word processor, Internet connection, photocopying, mailing, translation, full secretarial services, courier service and other business-related services. Private conference rooms and offices are also available.